“Sandwiches… get the sandwiches,” shouts a tall man in a wet green T-shirt and boxer shorts. IDF reservists move slowly, but intently, toward the concrete slab on which he has rested a large cardboard box. “The sandwiches aren’t the best thing that we’ve got donated, but we still have to eat,” remarked one of the reserve paratroopers. It’s Thursday, July 24; maybe they will be in Gaza tomorrow. 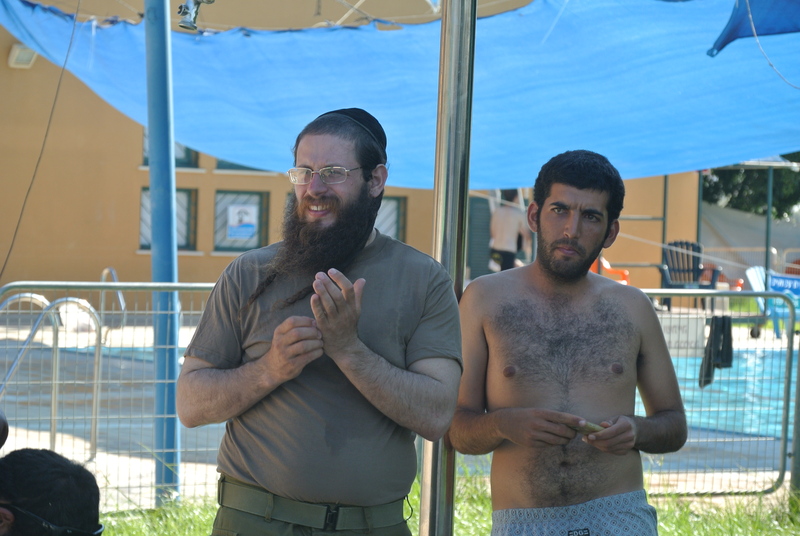 But for now, they are hanging out at a pool next to Netivot. Since the mass call-up of 40,000 reservists on July 8, large numbers of Israelis and foreign donors have rushed to provide support for the army during a time of war in Gaza. One of the organizations involved is Connections Israel, a nonprofit founded in 1998 which seeks to strengthen Jewish identity. The director of the organization in Israel, Mordechai Cohen, is a 38-year-old former paratrooper and father of five. A cheerful, modest man, he decided in mid-July that while others were simply sending food and other items to soldiers, often without asking what the units needed, he would start by asking first. “They said they wanted mattresses and tent shades for the sun and socks. They said ‘don’t send food,’ but wanted protection against mosquitoes,” says Cohen, as we talk in the hot beating sun a few kilometers from the Gaza border. Percussions pierce the air as outgoing artillery from a nearby position is fired at Gaza. It has been a long week. Seven Golani soldiers had been killed after an RPG hit their M113 APC in Gaza. The operation to destroy Hamas tunnels seemed open-ended. For units like the paratrooper reservists, the days were spent waiting, the nights training. Cohen explains that he had initially been in touch with several units, including Golani, but since they were in Gaza he couldn’t bring them items. The initiative to give some of the reservists a “day at the pool” was part of a variety of projects and connections he was making with soldiers in the South. At the pool, some of the soldiers swim and play in the water; others sleep on the grass and a few relax in the shade. In a large, open room abutting the pool, the detritus of war has been put aside – green uniforms, socks, boots, piles of guns. The soldiers span a wide age range, from 22 year olds doing their first reserve duty to one older man everyone claims fought in the ’67 war (if true, that would make him 66 years old). Other reservists are happy about the outpouring from the home front. “We get the feeling we are being hugged by the Jewish people. We get more than we need,” they say. Another young man, fresh from the pool, joins the conversation. “We could use some beer,” he says with a smirk. In the end, the unit is enthusiastic about the operation. “We are strong and ready and hope God is with us. We need to explain that Israel is the victim, and we try to be a moral army.” The man handing out the sandwiches, who wears the wizened face of almost 20 years of reserve duty, thinks this operation has gone off better than when he served in Lebanon in 2006. “We have had more time to plan and train,” Arye agrees, adding that “no nation would accept an enemy on its borders like this.